Elizabeth Turk hopes that “Shoreline Project” will live on after its Saturday, Nov. 3 debut, as a shared memory in the heart of the Laguna community. “Shoreline Project” will be the central spectacle of Laguna Art Museum’s sixth annual Art & Nature series taking place from Thursday, Nov.1 through Sunday, Nov. 4. While working as a Smithsonian artist/research fellow, Turk discovered an extensive shell collection at the museum. Using their digital photography and X-ray equipment, she uncovered asymmetrical growth patterns created by nature. By layering the photos, taken from various angels, she produced a body of work, which she named the “Seashell X-ray Mandala” series. It was part of her exhibition at LAM called “Sentient Forms” exhibited during the museum’s second Art & Nature initiative in 2014. The Seashell Mandalas have served as the basis for “Shoreline Project” commissioned by LAM for this year’s Art & Nature show, a pillar of the museum’s centennial celebration.The interactive performance will include 1,000 volunteers carrying LED-lit umbrellas bearing the seashell imagesdown the beach at sunset in both spontaneous and choreographed progression. In 2013, Jim Denevan used solar lanterns to make undulating lines and patterns on Main Beach for LAM’s first site-specific Art & Nature installation. 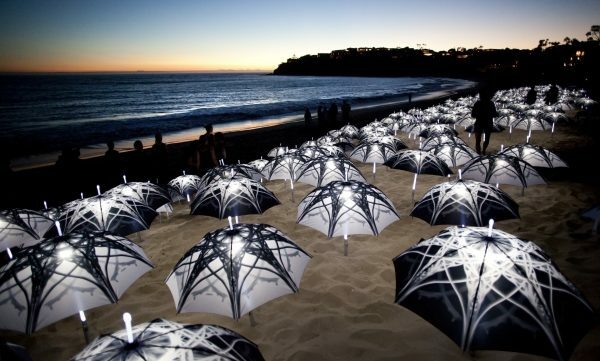 Lita Albuquerque paraded her white-clad performers along the waterline in 2014 (“An Elongated Now”) and in 2015, Laddie John Dill created a laser light show that blanketed the water and beach (“Electric Light Blanket”). The following year Phillip K. Smith erected 250 stainless steel posts (“1/4 Mile Arc”) that drew people to look at themselves and their surroundings reflected during changing light conditions. “Seascape” by Pablo Vargas Lugo was to have been the centerpiece of Art & Nature last year, but the Coastal Commission, which originally approved the installation, subsequently rescinded their blessing and derailed its installation. Art & Nature begins at Art Walk on Thursday, Nov. 1 with nature oriented exhibits at Kelsey Michaels Fine Art, Peter Blake Gallery, The Redfern Gallery, saltfineart + RAWsalt, Boys and Girls Club of Laguna Beach, Community Art Project, Gallery Q at The Susi Q and at LCAD Gallery, where previous works by Turk will be on display. The museum will offer free admission. At 7 p.m. on Friday, Nov. 2,Jane Munro will give the Art & Nature keynote lecture, “Charles Darwin: Art, Nature and Beauty,” at the museum. Munro is keeper of paintings, drawings and prints and acting assistant director of collections at the Fitzwilliam Museum at the University of Cambridge. “ She is the world’s expert on Darwin,” Malcolm Warner, LAM director said. Her lecture follows a 6 p.m. reception. Advance tickets are recommended and available at: lagunaartmuseum.org. On Saturday, two events precede “Shoreline Project.” At 11 a.m. the just released film,“Leaning into the Wind” follows sculptor and environmentalist, AndyGoldsworthy, exploring how his life experiences have impacted his art. It is directed by Thomas Riedelsheimer who also made Goldsworthy’s acclaimed, 16 “Rivers and Tides,” 16 years ago. At 2:30 p.m. Jane Munro, along with UCSD evolutionary biologist Lin Chao, and artist and UCLA professor Victoria Vesna, discuss art and nature in a conversation moderated by Warner. Advance tickets are recommended. The festivities wrap up on Sunday when the museum opens its doors, for free at 2 p.m.to visitors of all ages and offers a variety of interactive art, nature, and science activities, environmental information, and face painting. Warner says it was appropriate to select a local artist for the centennial celebration. Turk was born in Pasadena and raised in Orange County. She was awarded a MacArthur “genius grant” in 2010 and the Annalee & BarnettNewman Foundation award. She holds a master of fine arts from the Maryland Institute College of Art, Rinehart School of Sculpture and her Bachelor’s is from Scripps College, in Pomona. Those wishing to participate may call 949-494-8971 or register on the museum website or at shorelineproject.com and print out a waiver, which is the ticket to pick up an umbrella from one of the pods that will be located along Main Beach boardwalk. A post card program will be available there as well. 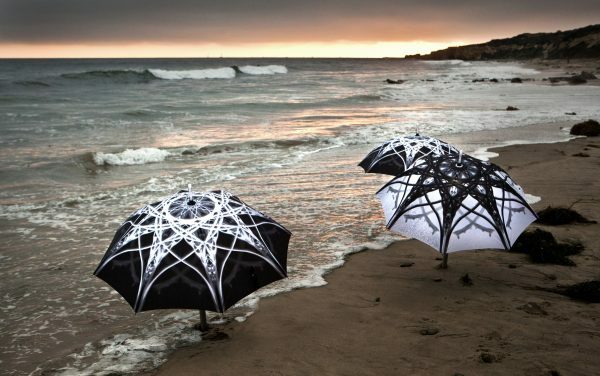 Much testing and tweaking went into the development of the umbrellas. “Duct tape was involved!” Turk said. The end result does work in the rain, weighs 1.7 pounds, and has on/off switches for canopy and shaft. “Managing the weight, due to the battery pack in the handle was something the performers had to learn while moving and dancing,” Turk added. 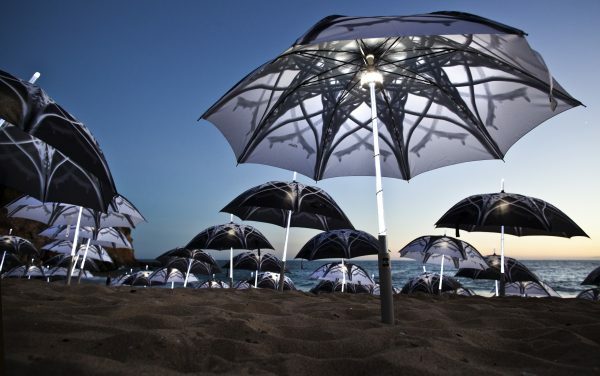 After sourcing parts from around the globe, the umbrellas were ultimately made in Britain. For non-participants, optimum viewing of the performance will be from the bluffs in Heisler Park where on-lookers will also get the best perspective of the lit umbrellas exiting the beach as their carriers disperse into the downtown area. Those lucky enough to claim an umbrella will be allowed to keep it as a memento of the “Shoreline Project” experience and a reminder that what bounds a community brings it together, Turk said. Drones will shoot a film of the performance during the event. “Hopefully it will be edited and ready for viewing with a few days after the event,” Turk said. Check LAM’s website for times and locations.